During a visit by the National Chaplain on February 5, 2019, Epsilon Nu's brothers enjoyed a terrific even of fraternalism. The brothers gathered at Villa Capri Restaurant in Altoona, Pennsylvania and enjoyed a wonderful Italian dinner. During the course of the evening National Chaplain Lentini, presented the chapter several Fraternity-related gifts/honors to the Chapter. 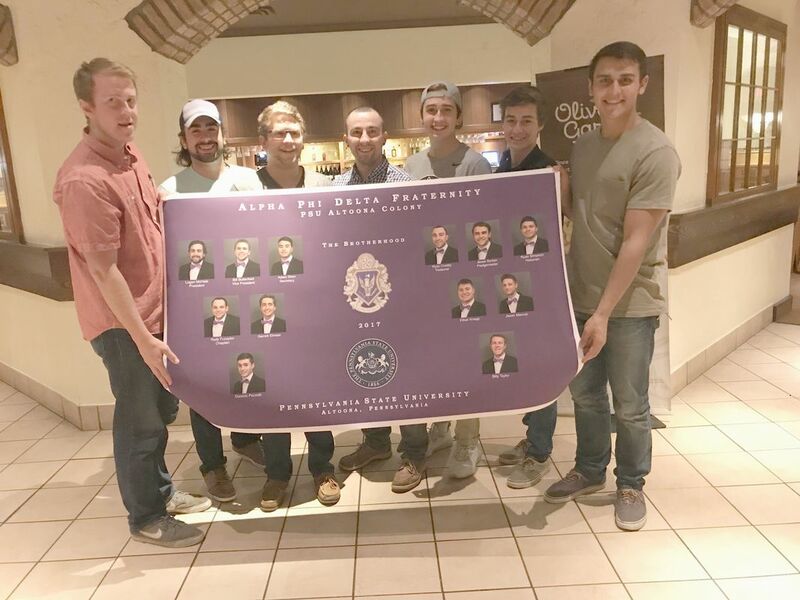 First the Chapter's members were each presented with a 2019 Epsilon Nu Chapter Photo Calendar. The calendar boasts various Chapter photos -- one for each month -- and lists the birth dates of each member of the Chapter since founding, as well as of our seven Founding Fathers, and our National Officers; additionally key Fraternity dates and school dates are highlighted. Then the Chapter was presented with a "Brotherhood Banner" produced by the National Chaplain, Fr. Lentini. The banner shows a pictorial history of the Chapter over the past few years; it is 96" long and in full color. Brotherhood Banners have been produced for several different chapters this semester as a gift from the National Chaplain. Finally, Past Chapter President Ryan Crosby received an official letter of thanks for his service as Chapter President of Epsilon Nu in 2018, and was then presented with the Past Chapter President Pin of the Fraternity. He was pinned by current President Dayton Strength. Brothers listening to the opening speaker, National President Todd Cusato, at the Western Leadership Conference hosted by Epsilon Nu Chapter. Our Epsilon Nu Chapter played host to its first ever National Event when this young chapter played host to the 2019 Western Leadership Conference on Saturday, February 2nd, 2019. Some 70+ brothers gathered on that chilly morning for the Conference (the Hadgkiss-Sundo Conference) held on the campus of Penn State Altoona. Epsilon Nu brothers hosted and coordinated this event filled with brothers from the Delaware Valley, Central Pennsylvania and Midwest Districts. The event went off without any problems and all who were present received an excellent fraternal education in topics ranging from risk management to social media usage to promotion of Italian heritage to chapter leadership, and more! It was a very successful day for Epsilon Nu Chapter and Alpha Phi Delta! The brothers of Epsilon Nu preparing to listening a presentation by one of our National Officers. 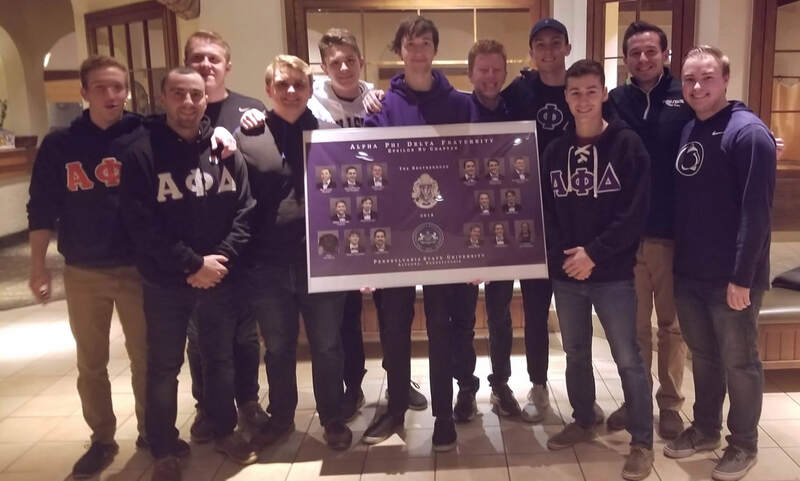 The Brothers of Epsilon Nu Chapter celebrated with National Chaplain Lentini on November 6, 2018 as he presented them with their 2018 Chapter composite. The brothers, including their newest initiates, attended a post-Founders Day Italian Dinner at the local Olive Garden Restaurant. Pictured above the brothers of the Chapter enjoying their new composite. On February 24, 2018, the Penn State Altoona Colony was voted a Charter by the National Council of Alpha Phi Delta, as our Epsilon Nu Chapter. 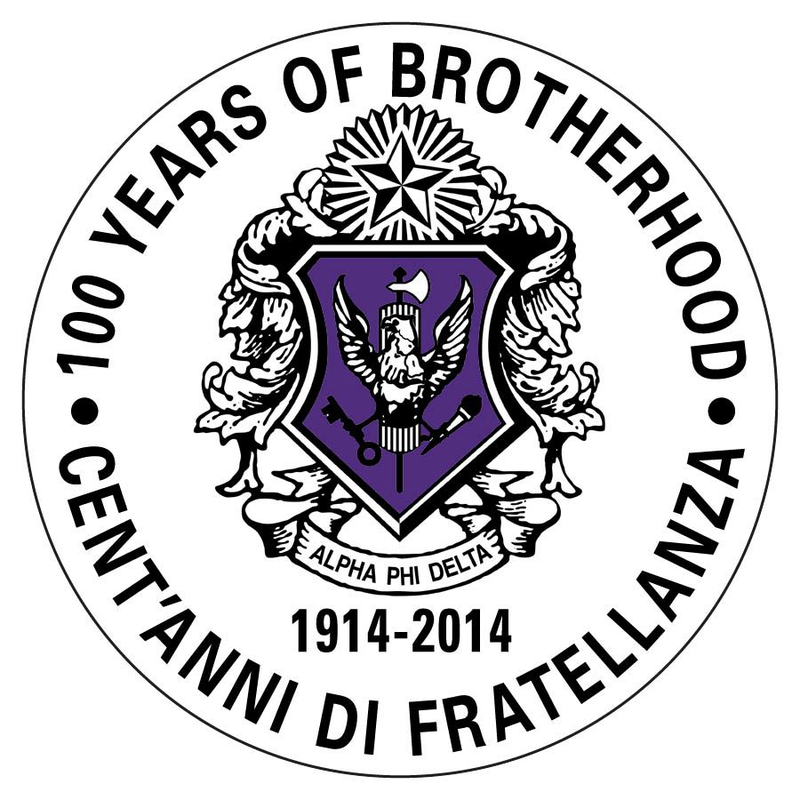 Epsilon Nu is the Fraternity's 106th Chapter. Here are the brothers of Epsilon Nu proudly showing off their new charter during a break at our National Council meeting. 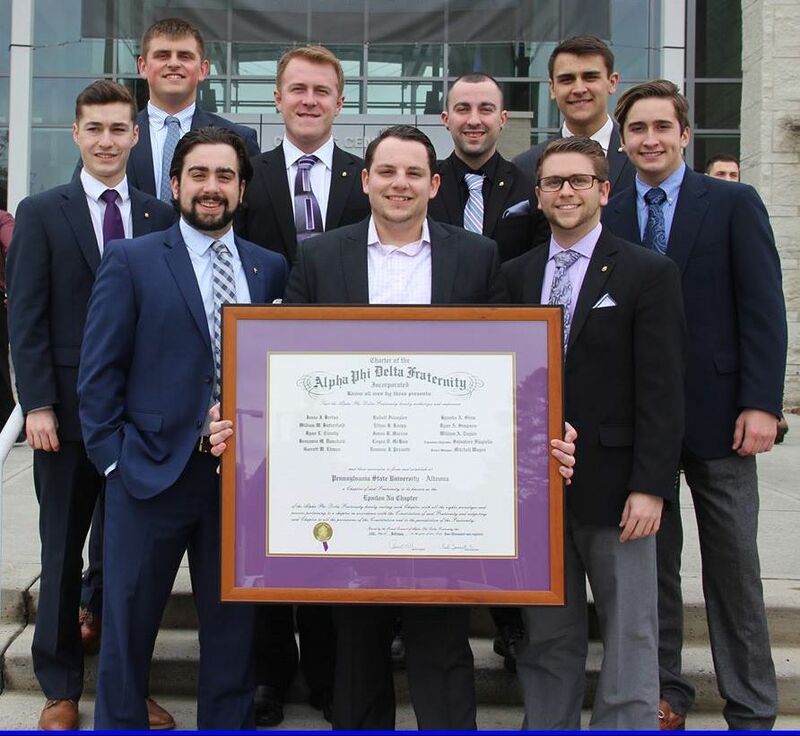 Epsilon Nu will be part of the Fraternity's Central Pennsylvania District. 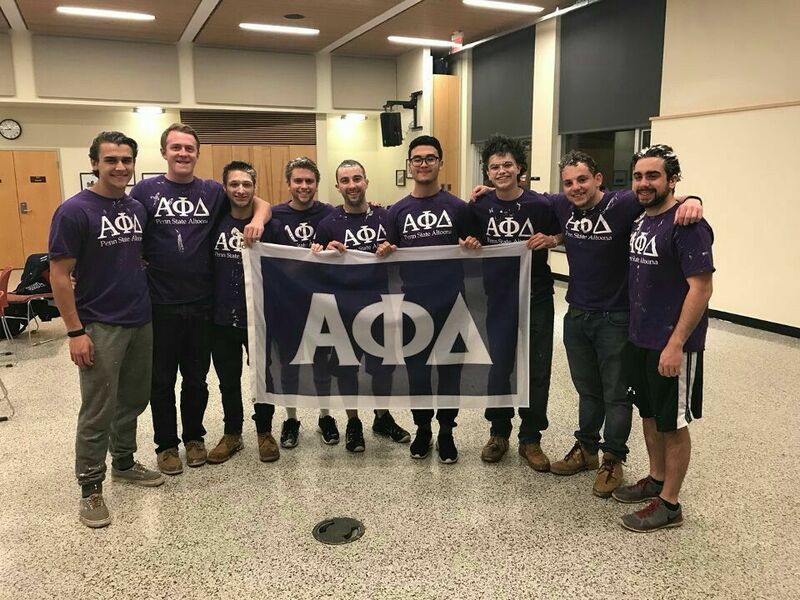 The Brothers of our PSU Altoona Colony welcomed our National Chaplain who gave a presentation to the brothers of our colony and their Delta Pledge Class on Thursday evening, February 8, 2018. The presentation told about the history of Alpha Phi Delta from its inception, with many details and facts that help tell the Alpha Phi Delta story fully, with a special focus on the Italian Heritage aspect of our history and its development. 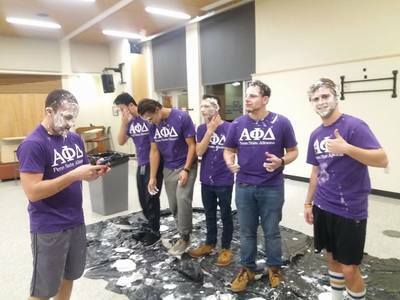 The brothers of the colony provided pizza to all in attendance. 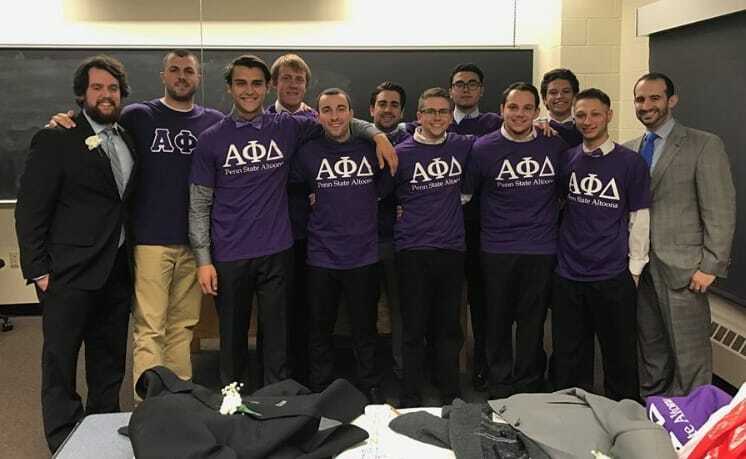 The brothers of our PSU Altoona Colony (back row) with the members of their Delta Pledge Class (front row) following the conclusion of an APD History Presentation. PSU Altoona Colony Celebrates Its 2017 Composite! The brothers of our PSU Altoona Colony received their 2017 Composite during a visit by the National Chaplain on October 12, 2017. The brothers gathered at Olive Garden Restaurant in Altoona to celebrate! 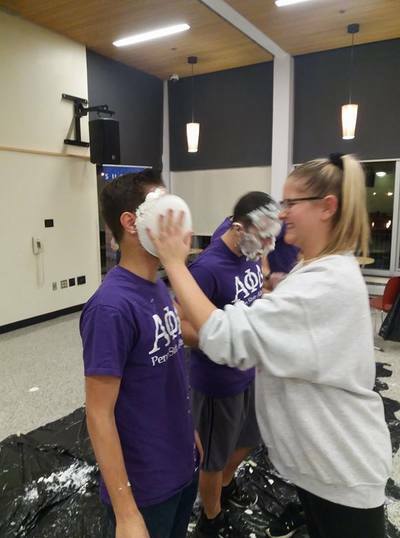 Alpha Phi Delta Fraternity's Colony at Penn State Altoona hosted its first event on campus on December 5, 2016: "Pie an Alpha Phi." 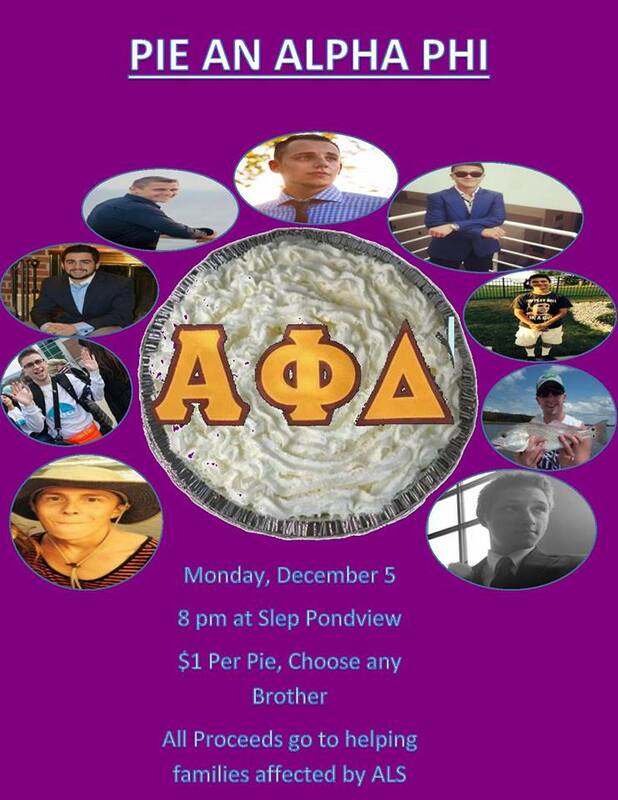 At that event, campus members got to pay one dollar each to pie any brother of Alpha Phi Delta. All proceeds from the event went to families affected by ALS. The brothers of our Penn State - Altoona colony pose for this picture, proudly showing off our colors and our letters, on campus at the end of the fall semester. The brothers left to right are: Jesse Bertan, William Taylor, Jason Marcus, William Butterfield, Ryan Crosby, Hyunbo “Adam” Shim, Ryan Simpson, Rudolf Fuzaylov and Logan McHale. Expansion Chairman Salvatore Flagiello (left) and Past Chi Chapter President and Project Manager Mitchell Wages (right), flank the new members of our Penn State Altoona Colony. The Colony brothers were initiated on November 5, 2016, 102 years to the day that our Fraternity was founded. We extend our best wishes to our new Pennsylvania State University Altoona brothers: Jesse Bertan, William Butterfield, Rudolf Fuzaylov, Jason Marcus, Ryan Crosby, Logan McHale, Hyunbo Shim, Ryan Simpson, and William Taylor. 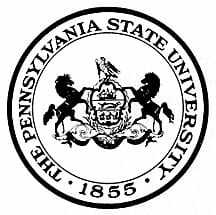 For information about the Pennsylvania State University - Altoona campus click here. Dayton Strength is the President of our Epsilon Nu Chapter. Alpha Phi Delta Fraternity's National Council has allowed students of the Pennsylvania State University - Altoona campus to join our Fraternity since February 24, 2018.